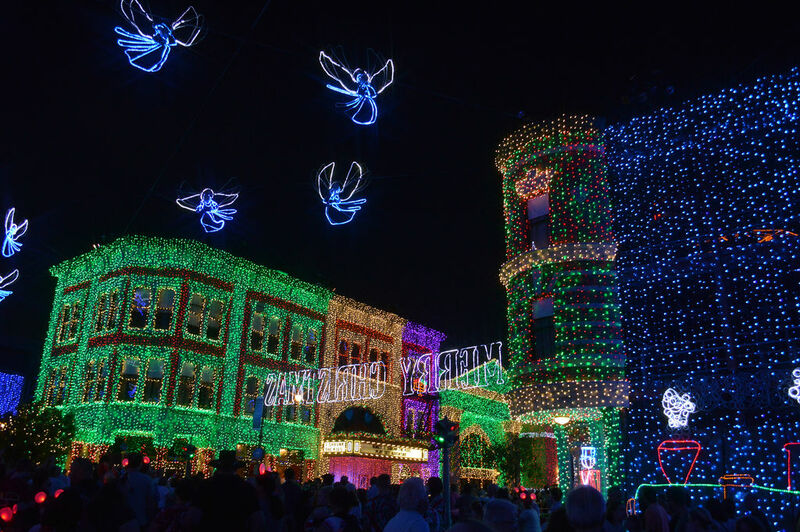 This week’s SATURDAY SIX looks at the Top Six Reasons We Loved The Osborne Family’s Spectacle of Dancing Lights. 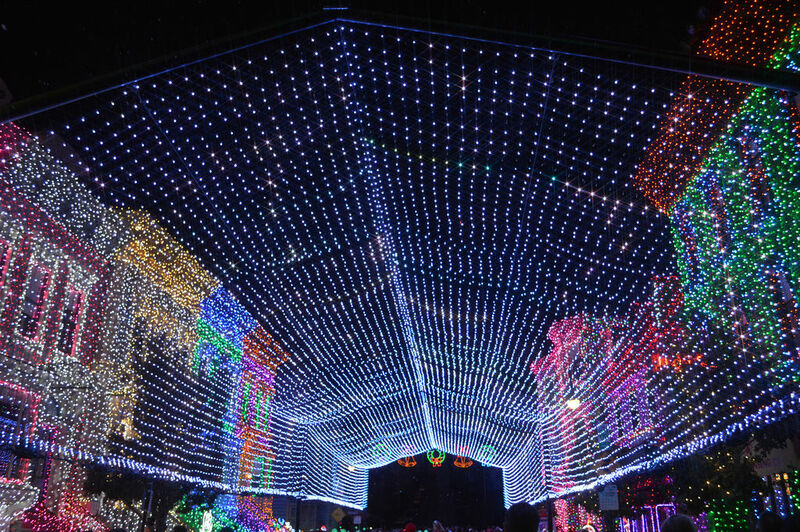 The Osborne Lights at Disney’s Hollywood Studios are always among the highlights of our theme park year. 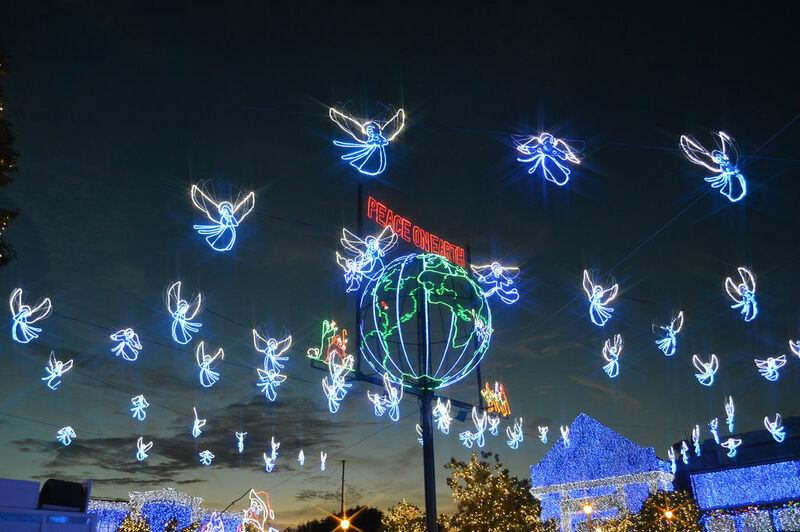 Sure, we have a great time at the Food and Wine Festival, Star Wars Weekends and Universal’s Halloween Horror Nights – just to name a few of Orlando’s best events – but walking through the lights at DHS every year never fails to take our breath away. Returning favorites and new surprises made this year’s edition shine bright once again, and today we’re going to look at the top six reasons we can’t get enough. 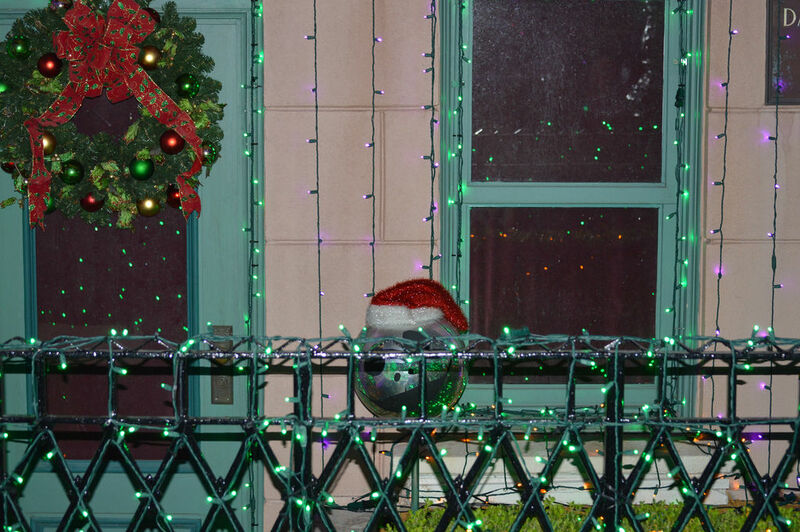 Legend has it that when the Osborne Lights were originally shipped to Walt Disney World from Arkansas (home of the actual Osborne family) there was a black cat Halloween decoration among them. Disney’s Imagineers have used the black cat as sort of an easter egg, putting it in a different place every year for guests to find. If you’d like to know where the black cat is this year, it’s location is described at the very end of this article. 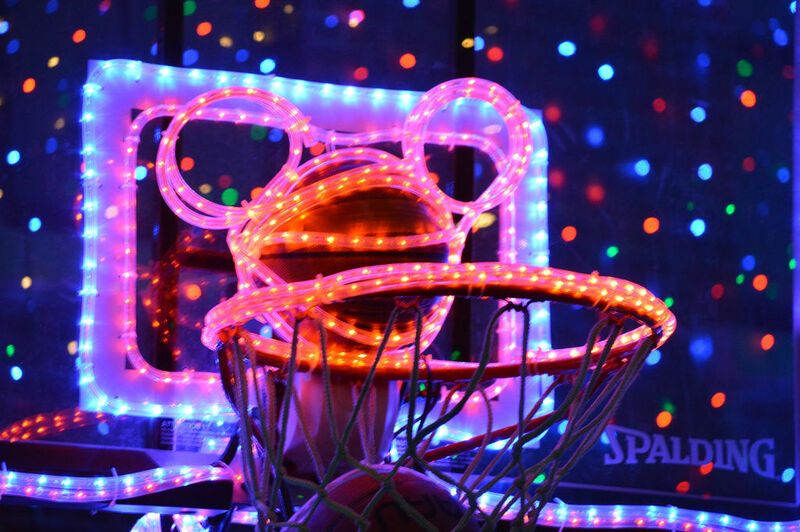 If you’re a fan of hidden Mickeys, then you are in luck as the Osborne Lights is full of them! With over 50 classic Mickey designs spread throughout the area, it might take several trips to find them all. Some are rather large, like this fun basketball one pictured, but others are cleverly hidden and take an eagle eye to spot. Located in the San Francisco area of the Streets of America, walking under this canopy made out of thousands of LED lights is something else to behold and is always one of our favorite things to take in. Disneyland may have their Nightmare Before Christmas Haunted Mansion overlay, but this year we got a little Jack Skellington in WDW as well. Not only is Skellington a popular meet n’ greet character at this year’s Mickey’s Not So Scary Halloween Party, but Jack – or at least his head – has also returned to the streets of America. Now this one was a shocker. 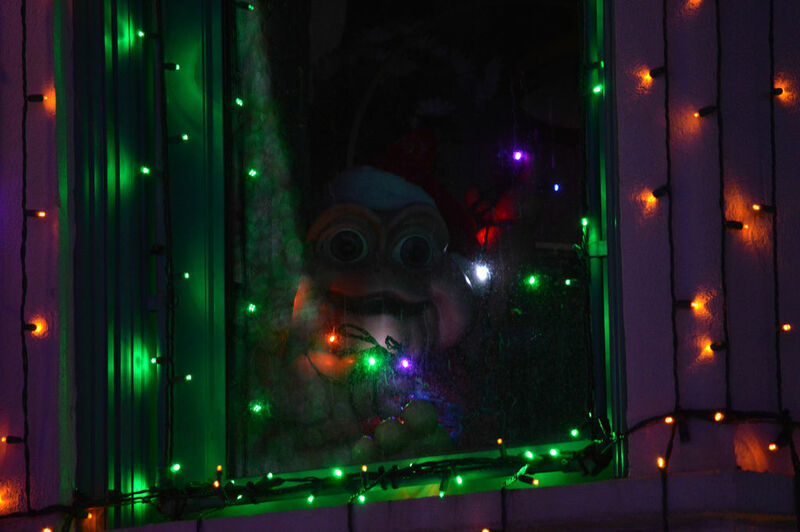 Baby Sinclair, from the Dinosaurs television show (which last aired in 1994) makes an appearance peeking through a window. What we love about this cameo is the sheer randomness of it all. Of all the shows to pick from, Dinosaurs? Don’t get us wrong, the show Dinosaurs was way ahead of its time and is a classic, but we’re pleasantly surprised there wasn’t a more contemporary reference to a show like Phineas and Ferb or tie in with a movie like Frozen or Planes. Bravo Disney, bravo. Disney’s Imagineers always deliver on the grandeur that is the Osborne Family Spectacle of Lights. There’s nothing you can compare it to and is one of the most amazing experiences you can have within a theme park. You are completely immersed in lights. Everywhere you look, even towards the sky, are millions of lights. The windows and balconies of all the buildings are filled with creative touches and details. There is snow being pumped into the air and that combined with the “dancing lights” (when music begins playing at the lights are synchronized with the music) can almost transport guests out of Florida and into a new realm of fantasy. The Osborne Spectacle of Dancing Lights is what makes Disney Disney. See you next weekend for the latest edition of the Saturday Six. If you had fun, be sure to check out The Magic, The Memories and Merch! 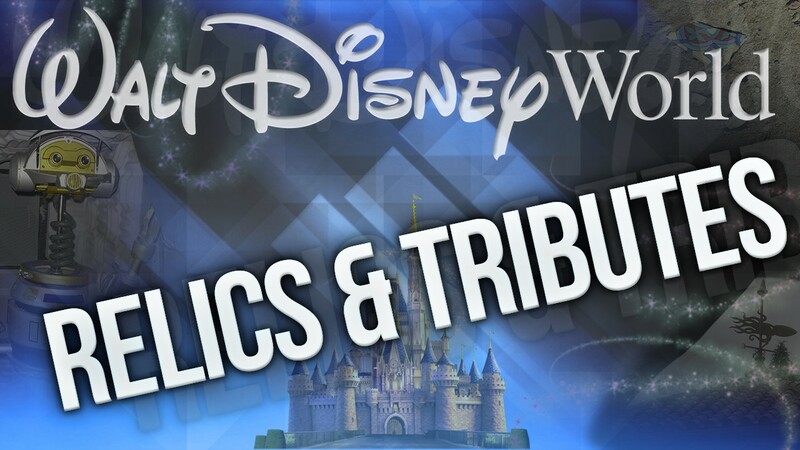 articles or the Pardon the Pixie Dust podcast. Special thanks to Universal NOW!’s Brandon Glover for his assistance with this article. SPOILER ALERT! 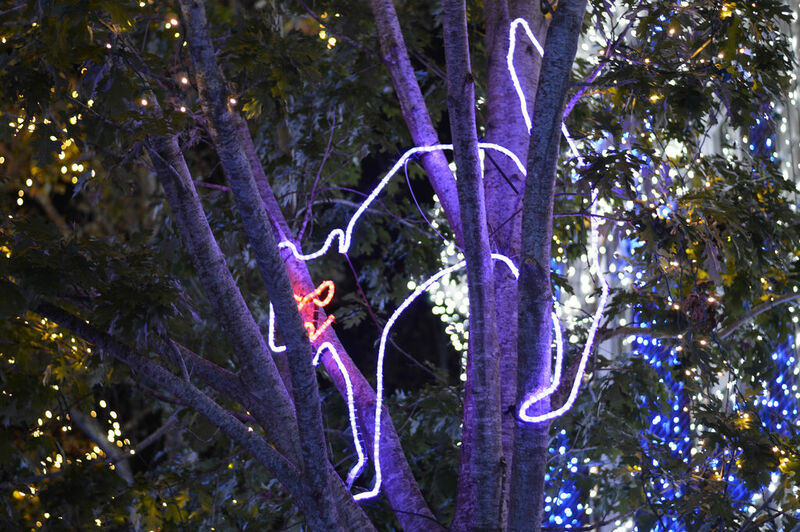 If you would like to know where the black cat is hidden this year, it can be seen in a tree near a food cart by the Lights Motor Action stunt show. Yay – won’t be too hard to find the cat this year! Thanks. I don’t have an issue, but you might want to “spoiler alert” the exact location of the cat. A lot of people like to find it for themselves. That’s a good call Stacey. I’m pretty strict about spoilers on movies and TV in my day-to-day life and hadn’t considered it in the theme park world. I’ve put the location in question at the very end of the article and labeled it with a spoiler alert. Thank you very much for the note. Yippeeee! I’m so excited to go on December 4th. Thanks for the spoiler! It took me forever to find the Black Cat last year! Hi Derek, that prop from Dinosaurs has been knocking around in the studios storage for years, well since 1994 in fact! Probably used just for the heck of it I’d guess. A few more hidden Mickey hints: Look at the red & green lit trees outside Muppetvision 3D as you approach the entrance, and look back at the upper stories of the building above the coffee shop when you leave. Is there no Razorback pig this year? Sorry! I forgot to mark my post about the Razorback pig that I wanted to be notified about followup comments. :-))) Last year the Razorback Pig was in the tree behind a snack cart… We haven’t been yet so we haven’t looked for it this year. Linda, I sent you an email on the location on the Razorback pig. Have a great time this year! Hey! Could you email me on the location of Baby Sinclair from Dinosaurs? I would love to see it myself! Sent you an email Kassidy. Have a great time at DHS!